Google Nexus 7 Will be available in India in October? Finally Nexus device for Indian users. 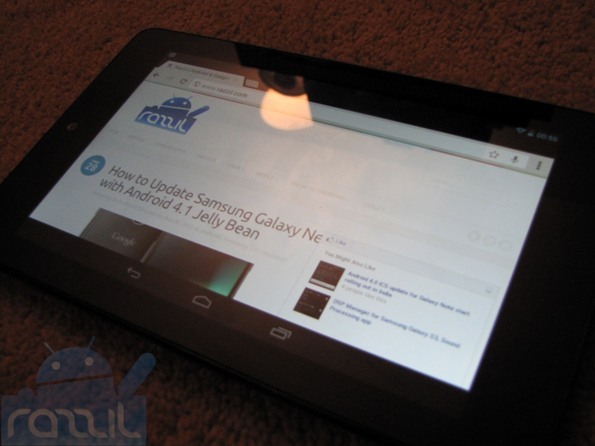 ASUS India confirmed that Google Nexus 7 will launch in Indian in October this year. This is great news for all those who want to buy Nexus device. ASUS Spokesperson has confirmed that Nexus would be available in Indian Market. We hope to complete the process to bring the tablet to India by the end of September. Once we have the sufficient stock, we will launch it here. Spokesperson didn’t comment on pricing & configuration details. But who cares at least we’ll have a Nexus 7. Nexus 7 built by both ASUS & Google, but the launch is handled by hardware partner. This means its depend on ASUS whether to release the tablet or not. A Few months ago, Samsung India broke the heart of many people(including me) who were waiting for Galaxy Nexus but Samsung India halt the launch so that they can launch Galaxy S3 in Indian market. The Nexus 7 is first tablet made by Google & Asus is powered by 1.3 GHz Tegra 3 processor, 1 GB of RAM, 1.2 MP front-facing camera, 7-inch IPS display with 1280 x 800 resolution and it runs on Android 4.01 Jelly Bean. Nexus 7 comes with two storage options 8 GB & 16 GB but unfortunately you can’t expand the memory. Currently Nexus 7 is up for preorder in US & UK for $199. Will Nexus 7 Survive in Indian Market? Nexus 7 comes with impressive battery life, you can play over 8 hours of HD videos, 10 hours, of web browsing or 10 hours of e-reading. Nexus 7 will be the great device for gamers thanks to Tegra 3 chipset. No 2G/3G/4G, you can access the Internet using Wi-Fi only. In Indian most people rely on mobile connection for their internet needs. People have to think twice before getting the tablet. ASUS has very less service center in India. After sales service would be tough for many people. I can’t say about whether tablet would be huge hit or not but it’s definitely worth to try. What you think about Nexus 7? Will you be getting one when it comes to India?